What’s in your notebook? – Pamela Wood. Or, more accurately, that headline should be: What is your notebook? I got to thinking about notebooks the other day at a concert. I noticed a couple of the musicians had marble composition notebooks on stage, filled with notes or maybe setlists — I’m not exactly sure. It made me smile to see a hip band using such old-school notebooks. When was the last time I used a composition notebook? Probably about the third grade. Composition books are long gone from my life, but I have very serious thoughts about notebooks. Every reporter has strong opinions about notebooks! I’ve seen my colleagues use all kinds of notebooks: legal pads, regular school-style notebooks, steno pads, reporter notebooks. Reporter notebook -- product image from Betty Mills Co.
For most of my note-taking, I use standard reporter notebooks. 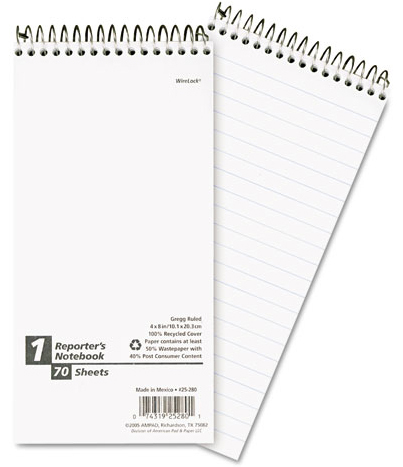 For those who don’t know about reporter notebooks, they’ve got the spiral at the top. They’re kind of like steno pads, but only half as wide. If you are ever at crime scenes, you might notice that police officers and fire investigators sometimes use similar notebooks. Often, they’re the same notebook, with just different lettering on the cover. I also have a special place in my work world for steno pads. I like to keep my phone messages all in one place and separate from my note-taking notebooks. I’ve found that steno pads work well — they have the spiral binding at the top, but they have more room for writing. Plus, the steno pad doesn’t get mixed up with my reporter notebooks. I’m sure my colleagues have just as many reasons for their fierce allegiances to certain notebooks.